OS/2 Warp Compatible Hardware List Web site: IntroductionOS/2 Scanning Solutions Overview, advantages of TAME/2. USB and SCSI Scanning with Tame/2: Introduction. The one-and-only OS/2 Warp Imaging and Scanning Solution for LPT, SCSI and USB! OS/2 and hardware... For more than a decade, OS/2 has been misjudged to have very limited hardware support. But in fact, if you dig some further, you'll notice that OS/2 Warp and eComStation offer extreme large and powerful hardware support. Not so long ago, there was no support for USB scanners or whatsoever; only SCSI models were supported. Not only are SCSI scanners a lot more expensive, but newer scanners are shipped with a USB interface only, and the parallel port interface has disappeared. With TAME/2, the time is to change. It offers an easy-to-use GUI to use your USB and SCSI scanners, and it is still being developed, in contrast to the older (though also very performant) drivers and scanning utilities. In this article, we will have a brief look at all solutions available for scanning on the OS/2 Warp platform, and we'll focus especially on TAME/2, and its advantages compared to other solutions. OCR on OS/2 bij review ocr finereader vermelden, ook zoeken nr spell check and/or second pass! Scanners are the eyes of your personal computer. They allow a PC to convert a photograph or drawing into code that a graphics or desktop publishing program can use to display the image onscreen and produce the image with a graphics printer. A scanner also can let you convert printed type into editable text using OCR technology. Two basic types of scanners differ primarily in the way that the page containing the image and the scan head that reads the image move past each other. In a sheet-fed scanner, mechanical rollers move the paper past the scan head. In a flatbed scanner, the page is stationary behind a glass window while the head moves past the page, similar to the way a copying machine works. So, in fact you notice that all your scanner does is take a photograph of a sheet of paper, and return it to the computer. The flatbed scanner requires a number of mirrors to keep the image that is picked up by the moving scan head focused on the lens that feeds the image to a bank of sensors. Because no mirror is perfect, the image undergoes some degradation each time it is reflected. But the advantage of a flatbed scanner is that it can scan oversized or thick documents, such as an encyclopedia book. With a sheet-fed scanner, you're limited to scanning a single, ordinary-size sheet of paper at a time. Today, you're most likely to find only flatbed scanners in computer stores. These scanners offer acceptable performance for home endings and are available for an acceptable price. In general, flatbed scanners come with a parallel printer or USB interface as default. Due to their better performance, the professional sheet-fed scanners are not widely spread, and often very expensive. These scanners still are often shipped with a SCSI peripheral interface. A scanner's sophistication lies in its capability to translate an unlimited range of analog voltage levels into digital values. Some scanners can distinguish between only black and white and are useful just for text. More precise models can differentiate shades of grey. Colour scanners use red, blue, and green filters to detect the colours in the reflected light. Regardless of a scanner's sensitivity to light or how the head and paper move, the operations of all scanners are basically simple and similar. We'll take you on a tour that is representative of the technologies involved - a flatbed scanner. We'll also examine one of the most important reasons for scanning a document - to convert its image into editable text by using OCR software. Finally, we introduce you to some general theoretic concepts and afterwards, we'll discuss programs and drivers available for OS/2 according to these standards. Since all modern scanners are flatbed scanners by default, we'll take a brief look at how such a scanner accomplishes its task. A light source (a strong lamp) illuminates a piece of paper placed face down against a glass window right above the scanning mechanism. Blank or white spaces reflect more light than do inked or colored letters and/or images. Based on the "amounts" of reflection a sensor will pick up (produced by the lamp beneath the glass), a certain digital value is created that can be sent to the computer so that it get in fact as raster/matrix of all colour values of each pixel of the entire image. Since a motor moves the scan head (and thus the light-emitting lamp) beneath the page, the scan head captures light bounced off individual areas of the page, each no larger than 1 / 90000 of a square inch. The light from the page s reflected through a system of mirrors that must continually pivot to keep the light beams aligned with a lens (to magnify, so that a large/small image can be shrunk/enlarged). The lens focuses the beams of light onto light-sensitive diodes (previously referred to as sensor) that translate the amount of light into a electrical current. The more light that's reflected, the greater the voltage of the current. If the scanner works with colored images, the reflected light is directed through red, green, or blue filters in front of separate diodes. As last phase of the scanning process, a ADC (Analog-to-Digital Converter) stores each analog reading of voltage as a digital pixel representing the light's intensity for a spot along a line that contains from 300 up to 1200 pixels to the inch. Finally, this digital information (bits and bytes) is sent to the PC, either via parallel printer, USB port or SCSI interface. Here, data will be stored in a particular format, so that graphics programs can open and edit the scan later. 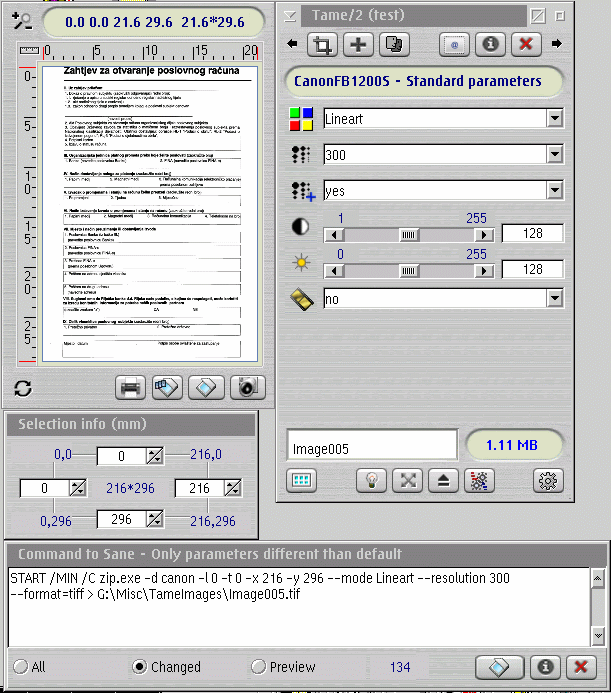 Optical Character Recognition (OCR) is the recognition of printed or written text characters by a computer. This involves photo scanning of the text character-by-character, analysis of the scanned-in image, and then translation of the character image into character codes, such as ASCII, commonly used in data processing. In OCR processing, the scanned-in image or bitmap is analyzed for light and dark areas in order to identify each alphabetic letter or numeric digit. When a character is recognized, it is converted into an ASCII code. OCR is being used per example by libraries to digitize and preserve their holdings. OCR is also used to process checks and credit card slips and sort the mail. Billions of magazines and letters are sorted every day by OCR machines, considerably speeding up mail delivery. There are several OCR solutions available for OS/2, and we'll give a brief look of them later on in this article. But how does it work? When a scanner "reads in the image of a document" (while in fact making a photograph of it), the scanner converts the dark elements (text and graphics) on the page to a bitmap (which in fact is a raster or matrix that holds colour and intensity data about each square pixel, each "dot", of the photograph taken). These pixels can either be on (black) or off (white). Notice that in order to apply OCR, we only need a black and white scan, since the text we focus is mostly black. Because the pixels are larger than the details of most text, this procedure degenerates the sharp edges of characters, much as a fax machine blurs the sharpness of characters. This degradation creates most of the problems for OCR systems. The OCR software reads in the bitmap captured via the scanner and averages out the zones of on and off pixels on the page, in effect mapping the white space on the page. This enables the software to block off paragraphs, alineas, columns, head-lines and graphics. The white spaces between lines of text within a block defines each line's baseline, which is an essential detail for recognizing the characters in the text. Based on these baselines, the OCR application can distinguish the different visual parts of the document. In its first pass converting images to text, the OCR software tries to match each character through a pixel-by-pixel comparison to character templates that the program holds in memory. These templates can include complete font characteristics like numbers, punctuation, extended characters. Because this technique demands a very close match, the character attributes, such as bold and italic, must be identical to qualify as a match. Poor quality scans can easily trip up matrix matching. Therefore, if you want to take real beneficious power of OCR, scan your base image at rather high resolutions. The characters that remain unrecognized go through a more intensive and time-consuming process called feature extraction (consider this the second pass of the OCR process). The OCR software calculates the text's x-height (the height of a font's lowercase x) and analyses each character's combination of straight lines, curves, and some other aspects like bowls (hollow areas within loops, as in o or b).The OCR programs know for example that a character with a curved descender below the baseline and a bowl above it is most likely a lowercase g. As the software builds its working alphabet of each new character it encounters, recognition speed accelerates. Because these two processes don't decipher every character, OCR programs take two approaches to the remaining hieroglyphics. Some OCR programs tag unrecognized characters with a distinctive character, such as @, # or ~, and then simply quit their job. You must use the search capability of a word processor to find where the distinctive character has been inserted and correct the word manually. Some OCR programs (like AbbySoft's FineReader for Windows) also display a magnified bitmap onscreen and ask you to substitute for the placeholder character. Still other OCR programs invoke a specialized spelling checker to search for obvious errors and locate possible alternatives for words that contain tagged unrecognized characters. For example, to OCR applications, the number 1 and the letter l look very similar, so do 5 and S, or cl and d. A word such as downturn might be rendered as clownturn. A spelling checker recognizes some typical OCR errors and corrects them. Finally, we conclude this section by noting that most OCR programs give you the option of saving the converted document to an ASCII file or in a file format recognized by popular word processors or spreadsheets. It is most likely that you, as OS/2 user, have installed a version of PMView for OS/2. From within this program you can acquire your image via scanning when you have - for example - installed the CFM TWAIN drivers. This linking between both the application and the scanning is accomplished by an implementation of TWAIN. TWAIN is a widely-used standard that is implemented in the form a some kind of a device driver that allows you to scan an image using a scanner directly into the application (such as PMView) where you want to edit the image. Without TWAIN, you would have to close an application that was open, open a special application to receive the image, and then move the image to the application where you wanted to work with it. The TWAIN driver runs between an application and the scanner hardware. TWAIN usually comes as part of the software package you get when you buy a scanner. It's also integrated into PhotoShop and similar image manipulation programs, like PMView. Thus, in fact TWAIN just sits between the application and the scanner driver(s). The software was developed from 1992 on by a work group from major scanner manufacturers and scanning software developers and is now an industry standard (Adobe, Xerox, Kodak, Fujitsu, DigiMark, AnyDoc, and some other companies). The name is not intended to be an acronym. In several accounts, TWAIN was an acronym developed playfully from Technology Without An Important Name. Device listing of all scanners supported by the scanning solutions discussed below can be found at www.os2warp.be. 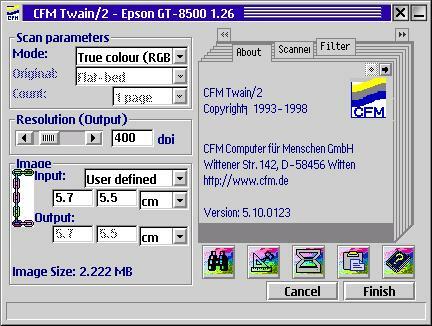 The commercial CFM Twain Scanner Drivers from the CFM (Computer für Menschen ) GmbH is a classic driver suite that has been around for several years now. With this robust driver suite, CFM offers a TWAIN-compliant scanning interface that supports a lot of SCSI scanners. Because of its TWAIN-modular design, you can acquire scanned images via your scanner out of each application that supports a TWAIN subsystem. Example of such programs is PMView, which is officially supported. 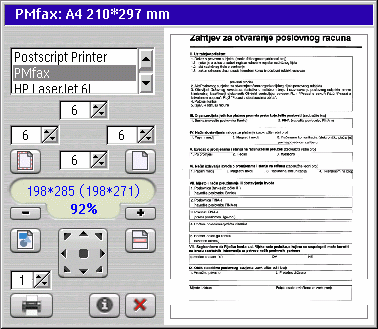 Most likely, every modern desktop publisher (like Maul Publisher for OS/2), optical character recognition and document imaging application comes with built-in support for TWAIN. Unfortunately, this product has been discontinued some years ago, and no updates nor bug fixes are released anymore, so the product is quite aging rapidly. The product is available for both the Windows and OS/2 platforms. The version for the former operating system is release 7.0, which supports more SCSI scanners than version 5.2, which was the latest version for OS/2 Warp. However, if you purchase CFM Twain Scanner Drivers v5.2 for OS/2 via Mensys or BMT Micro, you also get the 2 disk set upgrade package. The product is still sold for a price of approximately € 55,-. You can download a trial of the driver suite from Hobbes or directly from BMT Micro. There are no disabled functions nor time limits imposed when you use an unregistered demo / trial version, but all scanned images have a CFM DEMO stamp. The package comes with an installer, which is very easy and intuitive to use. There are several NLVs (National Language Versions): Dutch, English, French, German, Italian, Japanese, Korean, Portuguese and Spanish. Above, you can see a screenshot if the window that appear when you want to acquire (scan) an image out of PMView. As you can see, you have an easy-to-use graphical user interface (GUI), that offers all necessary settings conveniently all in one place. If CFM supported more scanners, then this would have been a good solution. However, support and development has been discontinued and the product has grown old. The Consumer Driver Pack supports desktop scanners and digital cameras like Hewlett-Packard, Epson, Fujitsu, etc. The Medium Speed Pack supports production scanners like Bell & Howell and select Fujitsu series. The High Speed Pack supports high end production scanners as well as some Kodak scanner series. The drivers supports black and white, gray scale, and color (not all supported scanners) as well as sheet feeders and transparency units to the TWAIN 1.8 specification level. It is very clear that these drivers were developed for a business target, because everything is so neat and well-designed. Extreme robustness and stability, support for a lot of high-end scanners. 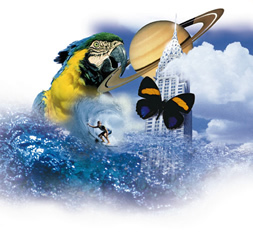 All TWAIN for OS/2 drivers are multi-threaded to take advantage of OS/2 to maximize data transfer throughput and minimize system resource hogging. It appears that development to these products has also been discontinued. Even though they're pricy when you buy them directly from STi, they actually do support a great deal of older professional scanners (only SCSI). The High Speed Driver Pack can, however, be purchased for a small amount of money in the eComStation Application Pak, a product of Serenity Systems Intl. The commercial ImpOS/2 has been around for several years now, and is somewhat a special case amongst others. Not only does Compart GmbH include OS/2 scanner drivers in the suite, but also a rather extensive, powerful and easy-to-use image manipulation utilities. Unfortunately, no matter how powerful the suite may be, development has been discontinued. Version 2.1 dates from April 1998, and this is still the latest. However, the package includes drivers for a lot of SCSI scanners, and there are two diskettes with updates available, which you also get when you purchase the product. The latest drivers were released in April 2001, and they are available from http://www.compart.net. Compared to the image editing programs available, ImpOS/2 looks a bit outdated. On OS/2, Embellish and Gimp are interesting alternatives. Something very interesting for power-users is that most functions in ImpOS/2 can be controlled via the REXX scripting language. This may not sound very useful in an image manipulation program, but it means that the possibilities of ImpOS/2 can be easily expanded, and combined with other programs. The latest version comes on a cd-rom which includes both an English and a German versions, but it would easily fit on a couple of floppy disks. Despite it's small footprint (both in terms of memory and disk space usage), ImpOS/2 is quite flexible in it's appearance. It supports a great deal of SCSI scanners, and can likewise be used as an alternative for the rather expensive STi Driver Packs. The estimated retail price of ImpOS/2 is about € 160 for the full package, and € 95 for an upgrade. This section is slightly a modified version of the SANE Introduction at www.sane-project.org web site. SANE stands for Scanner Access Now Easy and is an application programming interface (API) that provides standardized access to any raster image scanner hardware (flatbed scanner, hand-held scanner, video- and still-cameras, frame-grabbers, etc.). The SANE API is public domain and its discussion and development is open to everybody. The current source code is written for UNIX (including GNU/Linux) and is available under the GNU General Public License (the SANE API is available to proprietary applications and backends as well, however). Ports to MacOS X, OS/2 and Microsoft Windows are either already done or in progress. While SANE is an acronym for Scanner Access Now Easy, the hope is of course that SANE is indeed sane in the sense that it will allow easy implementation of the API while accommodating all features required by today's scanner hardware and applications. Specifically, SANE should be broad enough to accommodate devices such as scanners, digital still and video cameras, as well as virtual devices like image file filters. Several front-end for the OS/2 SANE port exist which comes in very handy, since SANE is rather difficult to use for daily scanning. One of them is TAME/2, mentioned in a separate section later on in this article. Another one is ScanIt/2, but this one has been discontinued during 2000. The homepage of the SANE/2 Project is located at http://home.tiscalinet.de/fbakan/sane-os2.htm. The SANE/2 port is available for free, but it's hard to cope with the difficult text-line commands, and settings. Based on SANE/2, TAME/2 is in fact a REXX Graphical User Interface (GUI) that makes the difficult use of SANE easy. Besides offering an easy-to-use and flexible interface, TAME also comes with a huge list of extra goodies, that make it very interesting for most people. Tame/2 keeps the promise of easy scanner access. You no longer must fight with non-mnemonic command lines to produce scans or to get the most out of your scanner; Tame/2 offer a complete set of scanning utilities which you can install via a simple installer. It is nothing more and nothing less than an bridge between your scanner, Sane, MMOS/2 and your preferred picture painting/drawing/publishing application. Beyond simply controlling the scan process, Tame/2 supports printing and faxing from scans, uses an OS/2 "light table" to facilitate handling your scanned images, scanning from a queue, and scanning over a network. Tame/2 is not a drawing or picture painting tool, therefore no picture editing capabilities are built in. For that, you'll still need to use PMView, Embellish, or another graphics suite. Tame/2 should work with every SANE release and with every Scanner supported by an OS/2 port of SANE. This is done using database of the specific settings for the scanners supported by SANE. At this moment, only one of these scanning solutions is actually developed actively: TAME/2. Not only does the suite offer an easy-to-use handy graphical user interface (GUI), but also it offers considerably more interesting and powerful features than SANE/2. Though other solutions still work fine, they are no longer being developed and these commercial solutions are aging rapidly. All in all, TAME/2 is a must if you want to use modern scanners on OS/2 Warp or eComStation. Last modified: 2004/08/30, 17:35 | This site is sponsored by Mensys B.V.